You may have noticed a serious lag in content lately, so I feel like a little site house cleaning is in order. I had been aboard a helicopter in Iraq which came under fire and...wait, sorry I mistakenly recalled someone else's memory. My excuse is not quite to a Brian Williams caliber, but it beats good ol' Skippy eating my articles. Actually, I was walking towards my car in an icy parking lot and...wham! Broken hip. Six days and one surgery later, here I am in Bryn Mawr Rehab recovering from a successful surgery on a fractured right hip. Please hold back the tears because, let's face it, you are an ugly crier. If you decide to put someone in your thoughts and prayers, save it for Clifford Phifer Lee, because the health of his sore elbow could potentially have a huge effect on the next decade of Phillies baseball. Fortunately, I will post articles soon stemming from my interviews in Clearwater with Chris Wheeler and Todd Zolecki. They offered some insightful stuff in what should make for some enjoyable posts. Just 28 days 'til Opening Day. Spring Training is all a matter of perspective. Stats can mean everything or nothing depending on the player, the team, and the situation. A veteran player like Chase Utley can skip a few weeks and still have his #26 penciled in the starting lineup on Opening Day. 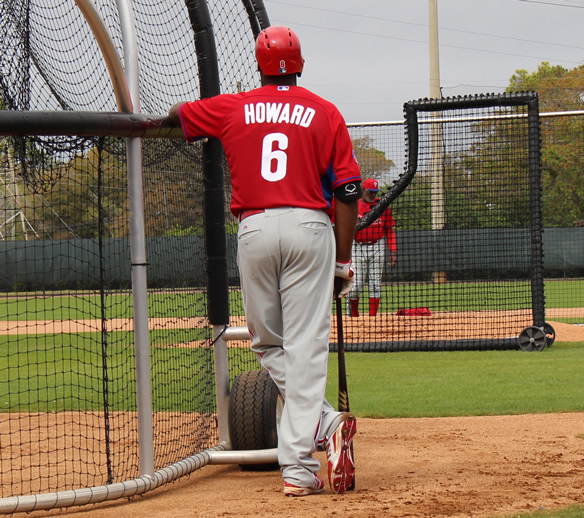 Some veterans like Ryan Howard use Spring Training as an opportunity to change their approach and prove their critics wrong. And for many other players, their spring performance may determine whether or not they will appear on a big league roster at all. The Phillies in 2015 have quite a few players in the latter categories. Here is a look at the players' who spring performance actually matters. This just in: the Phillies want to trade Ryan Howard and are willing to eat money in order to make it happen. In a breaking news story that actually is not really news at all, Anthony Castrovince of Sports on Earth reported the Phillies are willing to swallow around $50 million of the $60 million owed to Howard. Each year, Daniel Shoptaw from C70 At the Bat asks bloggers from around baseball to do a little Q&A regarding their teams heading into the new season. This year, I teamed up with Matt from That Ball's Outta Here and Rich from Fightin' Phillies. Jimmy Rollins understands Philadelphia as perhaps no player in Phillies history can. When Jimmy Rollins buttoned up his number 29 uniform as a September call up on a Sunday afternoon in 2000, the Phillies grabbed a rare win in a season in which they lost 97 games. It was their 13th losing season in 14 years and they lost 90 or more games in six of those seasons. 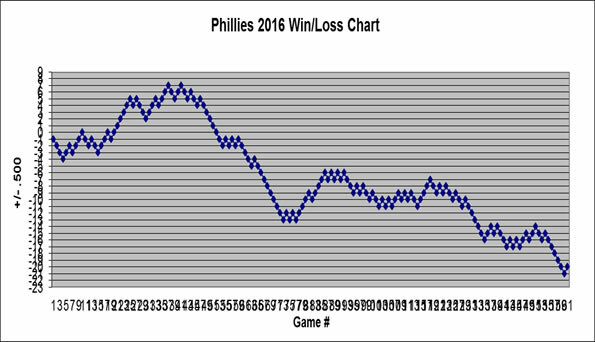 The Phils averaged nearly 92 losses in Jimmy's first five seasons in the minors. 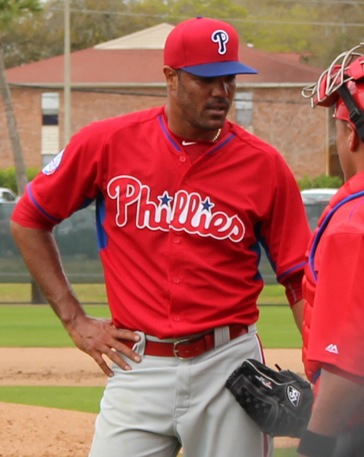 Rollins' career began when the Phillies were quite literally the team to beat. We are back with Philler up! 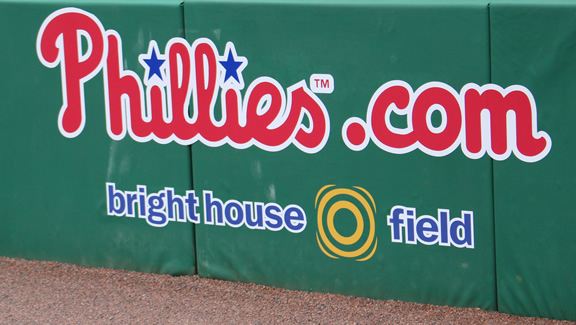 With the 2015 season quickly approaching, we are bringing back this news and notes segment to keep you up to date on all things (or, at least most things) Phillies. J.P. Crawford and Mario Hollands want to make sure the first 2015 edition is a total downer to ruin any optimism you might have for your destined-for-last-place Fightin Phils. Twenty years or so from now, when Aaron Nola retires from the game of baseball, if his career amounts to anything, people will point to his outing yesterday against the New York Yankees at Brighthouse field as the moment when it was clear he was on a path towards greatness. Cuban baseball players are all the rage these days. Nearly every week, some new Cuban name pops up that every baseball organization wants to throw their money at. If there was a gentleman's club for baseball prospects, the Cubans would make it rain every night. There was a time when Miguel Alfredo Gonzalez was one of those players. Everyone wanted in, and eventually the Phillies outbid the Boston Red Sox to sign MAG for six years and $48 million in 2013. The Phillies officially announced Domonic Brown has been placed on the Disabled List and will not be available for Opening Day. And now the question remains, how can the Phillies possibly replace the player who was quite literally the second-worst player in baseball last season? The contestants are: Darin Ruf, Brian Bogusevic, Jeff Francoeur, Jordan Danks, and Russ Canzler.